Valentina Gunina became the European champion for the second time in career repeating her two year's old success. A draw was enough for Valentina in the encounter against the Ukrainian champion Mariya Muzychuk as long as Russian was a full point ahead of her nearest rivals. 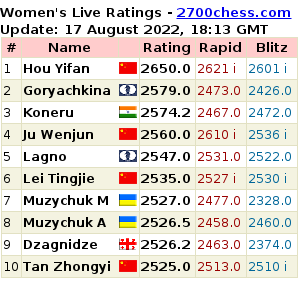 The draw was achieved and Gunina took clear first with 9 points out of 11 with the rating performance over 2700. 1.e4 c6 2.d4 d5 3.Nc3 dxe4 4.Nxe4 Bf5 5.Ng3 Bg6 6.h4 h6 7.Nf3 Nd7 8.h5 Bh7 9.Bd3 Bxd3 10.Qxd3 e6 11.Bd2 Ngf6 12.0–0–0 Be7 The alternative plan considered preparing castling long - 12...Qc7, while the move chosen by Gunina is usually for the castling king-side. However, as we will see there are nuances. 13.Ne4 Nxe4 14.Qxe4 Nf6 15.Qd3 One of the popular lines in this frequently played opening. Check out Valentina Gunina's games - she drew her first and last three encounters, in-between she won 7 games in a row! 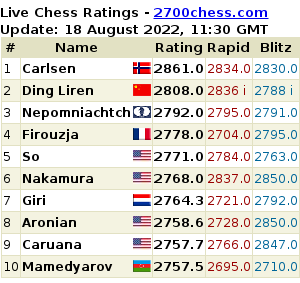 World Mind Accord Games rapid tournament winner is Valentina Gunina who has repeated her success achieved last year with Hou Yifan half a point behind.